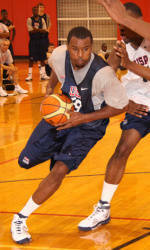 BELGRADE, Serbia (July 4, 2009) – In a well-balanced team effort that saw all 12 players score, including seven in double digits, as the 2009 USA Men’s World University Games Team (2-0) out-gunned South Korea (0-2) 113-76 on the Fourth of July in Belgrade, Serbia. The U.S. advances to the second round, where it will face Greece (1-1), which finished second in Group A, on July 6 (2:00 p.m. EDT), and Group A first place finisher Serbia (2-0) on July 7 (2:00 p.m. EDT). Finland (1-1) also advanced to Group I second round action. James Anderson (Oklahoma State / Junction City, Ark.) andQuincy Pondexter (Washington / Fresno, Calif.) led the USA with 14 points apiece;Talor Battle (Penn State / Albany, N.Y.),Lazar Hayward (Marquette / Buffalo, N.Y.) andDeon Thompson (North Carolina / Torrance, Calif.) contributed 12 points each; whileTrevor Booker (Clemson / Whitmire, S.C.) andJarvis Varnado (Mississippi State / Brownsville, Tenn.) added 11 points apiece.Evan Turner (Ohio State / Chicago, Ill.) grabbed a team-best nine rebounds in the USA’s dominant performance on the glass that saw the red, white and blue outrebound South Korea 62-21. “We knew they were going to do a lot of different things — a lot of run-and-jump, a lot of pressure,” said USA and University of Wisconsin head coachBo Ryan. “So we took the lay ups when we could. We needed to take better care of the ball, but, boy, it was so tempting to push it when they were extended. Shooting percentage wise, we ended up shooting it pretty well. The Koreans held an early 2-1 lead, however, it was very short lived. With 8:16 to play in the first quarter Anderson put the U.S. up 3-2, and the U.S. never looked back. Battle tossed in a 3-pointer 24 seconds later, followed by buckets by Varnado and Anderson. At 6:21 Pondexter scored off an offensive board, and the USA led by 10 points, 12-2. Korea called a time out to regroup at 5:55, but it didn’t help. The USA’s defense held its opponents to 1-of-7 shooting and four turnovers over the next four minutes, while gunning to a 10-0 run that blew the game wide open, 24-4. Korea hit four from the line and made a 3-pointer, while Pondexter was perfect from the charity stripe, and the quarter ended with the USA in the lead 26-11. The American defense continued to stifle South Korea in the second quarter, and by the end of the first half the U.S. held a commanding 56-26 lead. During the game’s first 20 minutes, the Asian side was outrebounded 27-10 and managed to grab just two offensive boards. The USA in the first half scored 11 points off of turnovers, 40 points in the paint and nine second-chance points. Additionally, by the time the halftime buzzer sounded, 10 U.S. players had points on the board, including 12 from Thompson and 10 from Battle. The USA slowed in the third quarter as South Korea put the pressure on and outscored the U.S. 26-24 to close out the third stanza trailing by 28 points, 80-52. Both sides swapped points to open the final period, and with seven minutes to go the lead was 87-60. The Americans strung together a 13-0 highlight-reel worthy run that gave the U.S. its biggest lead of the game, 100-60, with five minutes to play, and the team sailed in for the win. The USA, which dished out 21 assists, was a force inside the paint, scoring 82 points from inside. The American men also scored 21 second-chance points, compared to Korea’s five. Additionally, the USA shot a sizzling 61.1 percent (29-78 FGs) from the field, while limiting the Asians to just 37.2 percent (29-78 FGs).